I am looking to buy a 2" clear/transparent dice. Do you know of any online sources, preferable in Europe? About 10 years ago, I needed some 2" dice, the Café members gave me a gambling supply website, that had exactly what I wanted. You might use the search engine for the information. I don't remember the place I got them from. I believe 2 inches is 50 millimeters. Ivan, casinosupply.com have them. They are the 50mm which is 2 inch. About 7 US Dollars each. Thanks a lot guys, but no luck yet! Niva, did you even look at Dan Ford's reference? I went to the website, clicked on dice, and then 2 inch dice. What appeared was a clear 2 inch dice. Here is an active link, just click on it and it will take you directly to the product. Sorry my bad. I forgot to mention I needed one with less rounded corners. I have one of those. Trying to find a source for a variety of jumbo dice. There are other gambling supply shops (probably worldwide) that would be good to check too (the link Bill provided is a great source). I can usually get dice of various sizes and colors locally from a mom and pop toy store I go to a lot. If you have one around, check with them too. Amazon (US) has a bunch but a lot you must buy in bulk. Check your local Amazon also. Hope these help. I am from Malta lol. Most stuff I need to get from abroad. I am sure they gamble in Malta, and surrounding countries. I have to mention, that the only square corned dice I have seen are no larger then 1.25 inches. Why, I don't know, probably as to do with rolling the large dice. something that large will not turn over do to the large surface area when it lands. Only a guess. Maybe you can find one that blows up like a beach ball. Again, the only other choice would be to see a plastic company or Trade Show designer of corporate Trade Show displays, and see if they will make you some dice out clear plastic. Thanks Bill for the tips! Click here to view attached image. Try this company. I have visited them before and brought big dice of them. They post worldwide and I need something once and I emailed them and they were beyond helpful. and let others enjoy it as well! 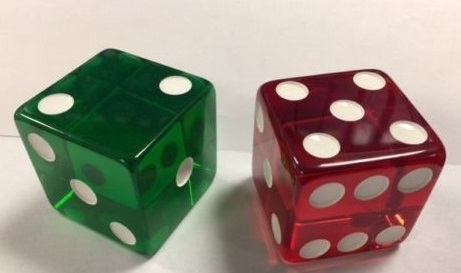 Go to kardwell.com then to novelty dice. They usually have what you are looking for. You nailed it. Thanks. But as I suspected the shipping is to expensive. More than twice the cost of the dice. This page was created in 0.16 seconds requiring 5 database queries.